The Liénard-Wiechert potentials are discussed in Feynman volume II section 21-5. If you have not re-read that section recently, I recommend you do so, but first let me offer a few words (and diagrams) that might clarify a couple of concepts. Issue #1: Feynman writes an integral in equation 21.28, and writes a summation in equation 21.30 and in the unnumbered equation that follows. The implication is that the rest of the formulas in the chapter could be treated as integrands, to be integrated over all space. This gets tricky because the main result, equation 21.34, involves a so-called «retarded time». If you want to know what fields are affecting the observer now, you have to know where the sources were at some earlier time. That’s simple enough for a source-particle that is not moving, or not moving very much. However, for a moving source-particle, the relevant time depends on position, and the relevant position depends on the time, so you wind up chasing your tail, unless you think about it just right. The smart thing to do is to integrate over all space and all time, subject to the restriction that the integrand lies along the observer’s light-cone. We can visualize what this means with the help of figure 1. For simplicity we show only one spatial dimension, plus the time dimension, so the light-cones look like diagonal lines, rather than full-fledged cones. These are shown in black in the figure. The observer is located at position x=0. Physics tells us that as a general rule, in any given time interval, the observer is affected by the distribution of electrical charge and current in its past light-cone. For the interval from t=12 to t=13, the relevant region of spacetime is indicated by the gray-shaded band in figure 1. For a more mathematical way of expressing this, see section 1.2. The spreadsheet used to produce these figures is cited in reference 1. 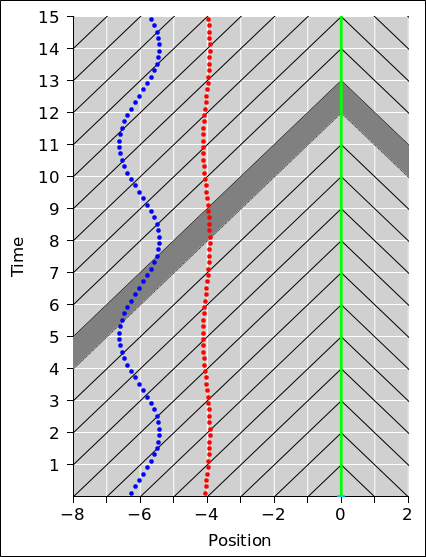 Issue #2: In figure 1, the red dots represent a charge that oscillates in the x-direction as a function of time, with a peak speed of 0.1 c. The blue dots are similar, except that the peak speed is faster, namely 0.6 c. The dots are equally spaced in time, according to the observer’s clocks. This is appropriate in terms of measure theory. That is, it means we can model the integral dt’ in equation 2b by counting dots. In any given time interval, the number of red dots affecting the observer is very nearly constant, as you can see by counting dots between successive light-cones. For the blue dots, the story is much more interesting. Because of the spacetime geometry of the situation, when the particle is moving toward the observer, it spends significantly more time moving along (or nearly along) the light-cone. You can visualize this by counting the number of dots between consecutive black lines. This explains the factor of 1/(1−v/c) that Feynman sticks in to obtain equation 21.29 from the previous unnumbered equation. He devotes a couple of complicated figures and an entire page of text to explaining this factor, but not everybody considers the explanation easy to follow. We can understand this factor much more easily, in terms of simple geometry, as shown in figure 1. It’s the density of sources near the light-cone. Note that figure 1 and figure 2 share the same time-axis. That means you can join the two figures together to make a 3D diagram. The density axis is perpendicular to the position axis, such that all of figure 2 lies within a contour of constant position x=0 when projected onto figure 1. The green background in figure 2 corresponds to the green vertical line in figure 1. To say the same thing another way, the “time” used for plotting all curves in figure 2 is the time at which the field affects the observer, at the so-called field point, (t, r). You can see that the red curve in figure 2 peaks two seconds earlier than the blue curve; this is because the red source particle is two light-seconds closer to the observer. In contrast, in figure 1 the sources peak at the same time, as measured according to plain old time, relative to the observer’s contours of constant time. Let’s be clear: The sloping black lines are contours of constant arrival time, while the horizontal white lines are contours of constant plain-old time (in the observer’s frame of reference). The density of dots that affect the observer is plotted in figure 2. For today’s purposes, “density of dots” refers to the number of dots per unit time ... more specifically, per unit arrival time. A stationary particle would have 5 dots per second, at all times. However, counting dots in an interval gives us only an average of the density over that interval. We would rather have something closer to an instantaneous estimate of the density. For this kind of discrete estimation, the shortest possible interval is the time between consecutive dots. The inverse of this interval is the density, i.e. dots per unit time. This is shown by the dashed black curves in figure 2. The peak density is about 13.5 dots per second, and occurs at time t=12.5. This is shown by a black dot in the diagram. The average density during the full second from t=12 to t=13 is somewhat less than the peak density. It is only 11 dots per second, as you can see by counting dots within the gray-shaded band in figure 1. Our discrete estimate (dashed black curves) differs from this formula (solid colored curves) by only about a percent at most, for the blue particle, under the given conditions. The discrepancy is much less for the red particle. In equation 1, the 1 in the denominator comes from the slope of the light-cone, while the v/c comes from the slope of the world-line of the particle. It’s just geometry. In this section, we assume the current density (including charge density) is known a priori. where r is the field point, i.e. the place where we are evaluating the field, and r′ is the source point, i.e. the location where the current density (including charge density) resides. Feynman did not write the potentials in the form equation 2. He avoided delta functions completely. Undoubtedly he knew about delta functions, but presumably he was trying to do the students a favor by not mentioning them. It is entirely possible that the students, at this point in their education, had never seen delta functions. Feynman did warn us near the end of section 21-1 that some “gory details” would get swept under the rug. See section 4.3 for more about this. 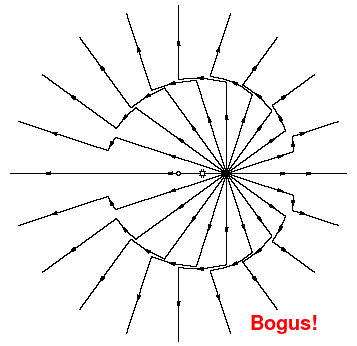 However, beware that even though A looks like a four-vector, it isn’t really. It behaves “almost” like a four-vector, but not quite. For details on this, see section 4.2.
which is, alas, not a closed-form expression, since t′ appears on both sides of the equation. Even if we know the source position r′ as a function of time, it is not easy to obtain an explicit equation for t′ (except in trivial cases, such as a stationary source). On the other hand, equation 6 does have a clear meaning, as you can see in figure 1: If the point (t′, r′) lies on the light cone, it contributes; otherwise, it doesn’t. For outgoing waves, we care about the past light-cone only. We expect the world-line of the source particle to cross the past light-cone only once, so equation 6 has a unique solution. If need be, you can find the solution (to a high degree of approximation) using a binary search. The four-dimensional delta function in equation 2 captures the light-cone idea. It makes everything nice and symmetric, and treats r and t on the same footing, to the extent possible. Another way of looking at things starts with a change of variable. Let s be the separation vector from the observer to some source-point. The absolute position of the observer is r so the absolute position of the source is r+s. Contours of constant |s| are shells surrounding the observer. Integrating over all s is the same as integrating over all space, just with a different way of looking at it. The last two lines are synonymous with the solutions Feynman wrote in the bold black box at the end of section 21-3. Again, beware that [ϕ, A] is not a 4-vector. where q is the charge of the particle. Equation 8 tells us there is current density (including charge density) along the world-line of the particle and nowhere else. When we stick that into equation 2, we get a four-dimensional integral with four delta functions multiplied together in the integrand. When doing the integral over t′ we have to be careful. Whenever you integrate something where the argument of the delta function is itself a function, it pulls out a factor of the derivative of the argument, as discussed in section 4. This gives us another way of understanding the density factor expressed by equation 1.
where on the RHS the primed quantities (t′, w(t′), and v(t′)) pertain to a source point that satisfies the light-cone condition, equation 6.
where U is a unit vector in the direction from the source point to the field point. This form is in some ways easier to understand, but in some ways easier to misunderstand. Beware that U is an odd duck, insofar as it depends on both the field point (t, r) and the source point (t′, r′). In particular, because of U, you cannot look at the equation and assume that all unprimed quantities are independent of the source point. The middle factor on the RHS of equation 11a, equation 11b, equation 13a, or equation 13b is a generalization of the density factor we saw in equation 1, generalized to handle motion in more than one dimension. If the source velocity is non-relativistic (or if the source motion is perpendicular to the line of sight) this factor drops out. Here’s another way of writing the potentials. This is compact and convenient for calculations. Note that as the speed |v| approaches the speed of light, if the source charge is moving toward the observer, the density factor in equation 1 becomes enormous. In other words, a relativistic oscillator radiates like crazy. In particular, suppose you have two oscillators with the same dipole moment and the same frequency of oscillation. One consists of a large charge moving at low speed, while the other consists of a small charge moving at high speed. If the high speed is near the speed of light, the high-speed oscillator will radiate vastly more than the other oscillator. 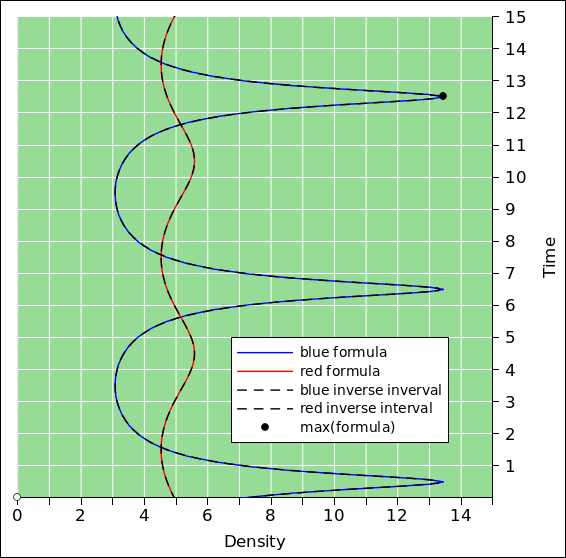 Also note that the blue and cyan curves in figure 2 are nowhere near being sine waves. The frequency of the radiated light will not be confined to the frequency of oscillation; higher harmonics will be present in abundance. 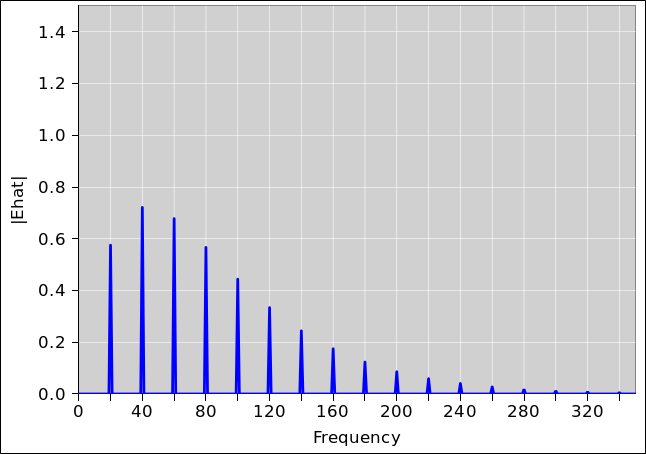 Figure 3 shows the spectrum for a source undergoing purely sinusoidal motion. The source has a frequency of 20, and a peak velocity of 0.9 c.
This example illustrates – yet again – the idea that when faced with any situation involving space and time, the first step should be to draw the spacetime diagram. Many things that would otherwise be very mysterious have a simple geometrical interpretation. If you can represent the situation on a spacetime diagram, the geometry becomes much easier to visualize. Spacetime diagrams are famously useful for special relativity. Keep in mind that special relativity is nothing more (or less) than the geometry and trigonometry of spacetime, as explained in reference 2. “Standard” relativity problems tend to involve factors of √(1−v2/c2). The Liénard-Wiechert density factor involves a different factor, namely 1−v/c. However, it’s still a spacetime geometry problem, and it still helps enormously to draw the spacetime diagram. In electromagnetic radiation, the E-field of a point source dies off like 1/r. The power and the energy density scale like E squared, so they scale like 1/r2, which is consistent with the idea that energy is conserved as the wave spreads out. In electrostatics, the E-field of a point source dies off like 1/r2. The energy density falls off like 1/r4, but it isn’t transporting any energy, so conservation doesn’t have anything to say about it. The question arises, can we obtain a consistent view of these two facts? This is not going to be easy, because starting with the 1/r2 Coulomb field of a point charge, I don’t see any way to explain the 1/r radiation field. By way of contrast, if there is some sort of cancellation, I can arrange something that falls off faster than 1/r2 – such as a dipole field that falls off like 1/r3 – but I cannot cook up anything that falls of slower than 1/r2. I’ve seen a number of books that claim to explain things this way, but it never made any sense to me. Can we take the low-frequency limit of the radiation field and recover the Coulomb field? Can we wiggle the Coulomb field and thereby produce the radiation field? Or are these fields related in some other way? The short answers are (a) no, (b) no, and (c) yes. The only way to explain the two behaviors is to realize that there are two different contributions to the field, one of which is dominant at short distances and long times, while the other is dominant at long distances and high frequencies. Let’s write the Maxwell equations in modern, four-dimensional form. For details on this, see reference 3. The ∇ operator on the LHS generates a large number of terms, and it turns out that different terms are needed to explain the Coulomb field and the radiation field. However, rather than pursuing the mathematics, let’s try to get a qualitative understanding. The easiest way to get a unified view of what’s going on is by considering the potentials, namely the vector potential and the scalar potential. For a nonmoving point source, we get a scalar potential that falls off like 1/r, as you can see from the Liénard-Wiechert formulas, such as equation 13b. As usual, it pays to think in four dimensions. We can construct a four-vector-ish quantity A. The timelike part of A is the scalar potential (commonly denoted ϕ), while the spacelike part of A is the three-dimensional vector potential. So now we can ask, given that the radiation field falls off like 1/r, why can’t the static electric and static magnetic fields do the same? Why do the static fields have to fall off like 1/r2? Consider the time derivative of the spacelike part of A. In general, this term gives rise to the electric component of the radiation field. In the far field it falls off like 1/r. For an unaccelerated charge, the current is not changing, so the time derivative vanishes, so this term is zero. For a stationary charge, there is no current to begin with, and the current is not changing, so really this term is zero squared. Consider the time derivative of the timelike component of A. This term is zero always, because of the antisymmetry of the wedge product. Consider the spacelike derivative of the timelike part of A. This gives us something nonzero. It does not depend on frequency. It falls off like 1/r2. We recognize it as the Coulomb field. Consider the spacelike derivative of the spacelike part of A. For a stationary point charge, this is term is zero, because the spacelike part of A was zero to begin with. For a steady current, this term is nonzero. It falls off like 1/r2. We recognize it as the static magnetic field. For a current that varies in time, A will vary in time in the obvious way. It will also vary in space, because of the retarded time in the Liénard-Wiechert formula. In the far field, the dominant contribution to the field comes from the spatial derivative of this spatially-nonuniform potential (rather than from the aforementioned magnetostatic term). In the far field, the dominant term falls off like 1/r. We recognize it as the magnetic component of the radiation field. Starting from a point charge (or a dipole), we can cobble up a field that goes like 1/r by taking two time derivatives: The first derivative gives us a current, which contributes to the spatial part of A in accordance with equation 13a. The second time derivative gives us the electric field in accordance with equation 16. To repeat: Yes, we can have an E-field that goes like 1/r, but it requires taking either one time-derivative of the current or two time-derivatives of the point-charge potential. We recognize this as the radiation field. Conversely, if we want a static E field, we need to take a spatial derivative of the point-charge potential, and that gives us something that falls off like 1/r2. We recognize this as the Coulomb field. As discussed in section 3.1, it is not possible to simply wiggle the Coulomb field and thereby produce the radiation field. However, this doesn’t stop people from trying! See e.g. reference 4. Suppose we have a point charge that is initially at rest at the origin. At a time 1.4 seconds ago, it starts moving, then at a time 1.0 seconds ago, it stops moving. A partially correct diagram of the field lines is shown in figure 4. 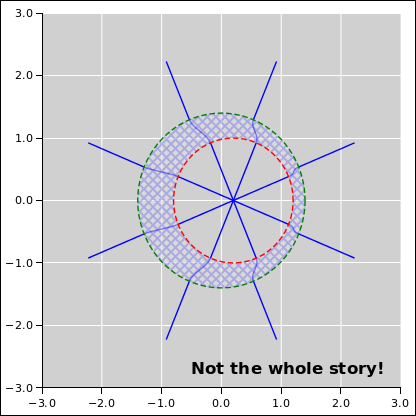 In the figure, the green circle is a slice through the light cone of the “start” event (i.e. the start of the motion of the source), sliced at the current time. Similarly the red circle is a slice through the light cone of the “stop” event. One interesting (and correct) aspect of this diagram is that outside of the green circle, we have a plain old Coulomb field, centered on the initial position of the particle. Similarly, inside the red circle, we have a plain old Coulomb field, centered on the final position of the particle. Another interesting feature is that the two circles propagate outward at the speed of light. So it is reasonable to assume that there is some sort of wave-like behavior involved. It must be emphasized that figure 4 does not attempt to portray (much less explain) what goes on in the shaded region between the two circles. In this region, we find the radiation field, which is described by non-Coulomb terms in the Maxwell equation. Specifically, while the particle is in motion, there is a current, and this makes some wholly new contributions to the field. It is possible to calculate the correct field in this region, but it’s more work than I feel like doing at the moment. Sometimes people who ought to know better draw diagrams that are more detailed yet less correct, such as figure 5. It is conceptually wrong to depict a transition region that is everywhere “thin” compared to the distance that the particle moved. Suppose the particle is moving slowly compared to the speed of light. Then the transition region is everywhere thick compared to the displacement of the particle. Suppose the particle speed is near the speed of light. Then the transition region will be thin in the forward direction, but it will be very non-uniform. It will be extra-thick in the rear direction. In reality, the radiation field is transverse. Figure 5 purports to show this, but only by cheating on the speed. In the transition region, the angle of the field lines depends on the distance that the particle moves, divided by the thickness of the region. The ratio cannot possibly be very large, as previously discussed. For any realistic speed, the Coulomb-based diagrammatic approach shows markedly non-transverse field lines, as you can see in figure 4. As a related point, the boundary of the inner region should be centered on the final position as in figure 4, not offset as in figure 5. At large R, the Coulomb field should be negligible. Whatever remains should fall off like 1/R and be purely transverse. I don’t see how to obtain a 1/R dependence or a transverse field, if we rely on a Coulomb-based diagrammatic construction. This is a problem with both figure 5 and figure 4. “Fixing up” the field lines to handle the transition region requires gross violations of Coulomb’s law. Among other things, there is a ton of curl in this region. The implicit rule of “fixing up” the field lines by connecting them in the simplest, most direct way seems not well founded in the laws of physics. In particular, once you realize that we are going to have nonzero curl in the transition region, you can add closed loops of E ... and it will take some very fancy hand-waving to convince me that the number of closed loops shown in the diagram (i.e. zero) is correct. In figure 5, the “kinks” where the field lines enter and exit the transition region are unphysical. They require infinite acceleration, and would radiate infinite energy ... not just infinite energy density, but infinite energy. Note that figure 4 takes care to avoid sharp kinks. Very commonly, people who ought to know better refer to the source time t′ as the «retarded» time. That’s incompatible with the plain meaning of the word. The reality is that the field at (t, r) is retarded relative to the source at (t′, w(t′)). Constructive suggestion: Whenever you see a reference to «retarded time», don’t take it literally. Replace it with the light-cone condition, equation 6. If the source point is on the light cone it contributes; otherwise it doesn’t. Very commonly, people use a notation that seems to suggest that both the field-point r and the source-point r′ are to be evaluated at some «retarted» time, which is of course insane. The reality is that in spacetime, the source-point is (t′, r′) and the field-point is (t, r), and these are related by the light-cone condition, equation 6. Sometimes people who ought to know better assert that the three-dimensional vector potential the spacelike part of a four-vector. It “almost” is, but not quite. See section 4.2. Sometimes people who ought to know better try to construct the radiation field by wiggling the Coulomb field, as discussed in section 3.2. Beware that A is not quite a 4-vector. It does not behave properly under Lorentz transformations. Loosely speaking, if you start out with a vector potential in a certain gauge and then change to a different reference frame, you get a vector potential with the same physical meaning in some other screwy gauge. If you try to calculate A by evaluating it in one frame and then boosting it into another frame, you will almost certainly get the wrong value for A. The electromagnetic field F is a well-behaved bivector. The exterior derivative on the RHS annihilates any and all gauge fields. At some sufficiently-vague conceptual level, the problems with A don’t matter ... but if you’re doing actual calculations, sometimes they do matter. In any case, we can make the problems go away by defining a new equivalence relation. Suppose we have two potentials A1 and A2. We say that A1 is equivalent to A2 modulo a gauge and write A1 ∼ A2 if-and-only-if they differ by a gauge field, i.e. if ∇∧(A1 − A2) = 0. You can verify that this is a legitimate equivalence relation, i.e. that it is reflexive, symmetric, and transitive. If A1 ∼ A2, we can’t assume they are “equal” because they are not necessarily equal in the component-by-component sense ... but they are equivalent modulo a gauge, and they represent the same physics. We can achieve a similar result by defining an equivalence class: Let Ã1 be the set of all potentials that differ from A1 by a gauge. The set Ã1 is closed under gauge transformations. We can then write Ã1 = Ã2, because the two sets contain exactly the same elements. Consider the four-velocity of a particle: In spacetime, in its own rest frame, it is moving toward the future at a rate of 60 minutes per hour. Meanwhile, the three spacelike components of the four-velocity are zero. We can use this idea to understand the current density as given by equation 3. The timelike component of J is cρ. That represents a current in spacetime, flowing toward the future. where x0 is a root of the function g(); that is, g(x0) = 0. The “⋯” indicates that there is one term for each root. However, for the case of outgoing waves from a point charge, there is only one root that we care about. (For incoming waves impinging on an absorber, there would be another root, somewhere on the forward light-cone.) You can easily verify equation 22 by doing a change of variable in the integral. Beware that even though it is usually better to work in four dimensions, we are treating r and w(t′) as three-dimensional vectors, and the dot product in equation 23c is a three-dimensional dot product. The part of the spreadsheet that produces figure~3 depends on a Fourier transform function that may be unique to gnumeric.